The Nintendo Switch hit stores last Friday, and the gaming world is buzzing about the convertible handheld/home console hybrid—and top launch title, The Legend of Zelda: Breath of the Wild. While you may never get the chance to play the new Zelda on your computer, there is a surprising connection here: the Joy-Con controllers can pair with your Mac. That’s right: the little control nubs that bookend either side of the Switch’s screen detach from the unit, and since they pair via Bluetooth, you can use them with Mac games. We certainly wouldn’t recommend buying a Switch solely to use the Joy-Cons on Mac, but if you game across multiple devices and snagged the console, then Mac compatibility is a sweet perk. And the Switch’s beefier Pro Controller works with macOS, as well. Want to wield some Nintendo hardware with your Mac? Here’s how to get set up, how well it all works, and why you should even bother. 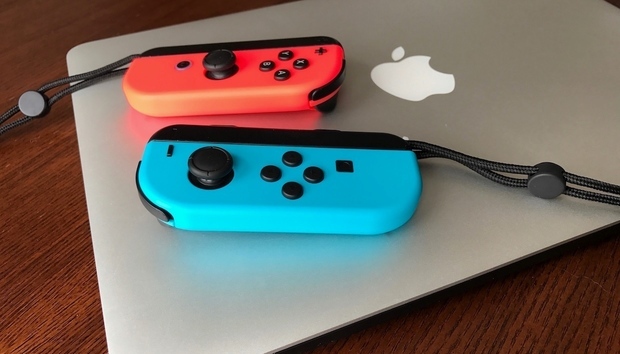 As first spotted by software engineer Sam Williams earlier this week, the pairing of Switch controllers to your Mac is surprisingly effortless. Just hold down the little pairing button on the top of either Joy-Con, open up Bluetooth preferences on your Mac, and you should be able to pair the devices right away. Now you have a Nintendo-made Mac controller. Each Joy-Con registers as its own controller, however, and unless someone creates a software solution to enable it, they can’t be used together simultaneously as a single unit on Mac. That’s a big limitation, since each Joy-Con acts like half a controller: it has one analog stick and four primary face buttons, along with two small shoulder buttons. And since you’re holding it sideways, the additional shoulder and trigger buttons on the lower left or right side won’t really come into play. Each Joy-Con functions independently, but hopefully some enterprising soul gives us a way to use them in tandem. On the Switch, you have different kinds of configurations. The two Joy-Con pads can be used simultaneously, either attached to the screen or held separately, but each can also be used individually for multiplayer games. For example, you’ll be able to throw down in next month’s Mario Kart 8 Deluxe with two players each wielding a single Joy-Con. And that’s essentially the experience you get on Mac: a Joy-Con, held sideways, with a limited array of inputs. As such, you’ll have to choose carefully when it comes to games. Most 3D games are going to be too complex to work with a single analog stick, so skip the first-person shooters. I fired up Steam and had a look at my library, and found that it was a perfect fit for tower defense great PixelJunk Monsters Ultimate, one of my all-time favorite PlayStation games that was ported to Mac. After playing with the in-game bindings, I was dropping towers and running around with ease. It felt fantastic. Same with 140, an inventive, ultra-minimal side-scrolling platform game. Spend a minute mapping the buttons in OpenEmu and you’ll be playing retro classics with the Joy-Con. Truth be told, the Joy-Cons are absolutely perfect for emulating old-school games. The legality of emulation is a sticky subject, but if you own the original game, you’re entitled to have a backup ROM. Using the Joy-Con with OpenEmu was a total breeze, and within moments I was immersed in Super Nintendo classics like The Legend of Zelda: A Link to the Past and Super Mario Kart like I was a kid again. Even a 3D legend like Super Mario 64 played well with the Joy-Con, although I lacked enough buttons to have manual camera control. Emulation has never been a strong personal interest, as I always felt like you lost something in the transition—but playing classic Nintendo games using actual Nintendo hardware really helped bridge the gap. It was a seamless experience, and I think it’ll be one of the biggest draws for using the Joy-Con controllers on Mac. That’s especially true since Nintendo released the Switch without its Virtual Console service for selling retro games (it’s coming eventually), so you won’t be playing those on the actual device for now. If you don’t already have a Mac-compatible gamepad, then the Joy-Con is certainly better than nothing. It’ll work with some games, but obviously not all of them given the lack of a second analog stick and additional buttons. And even for those who already have a fully-featured Mac controller, like the SteelSeries Stratus, the Joy-Cons have other advantages. Multiplayer Mario Kart on your Mac? Yes, please. For example, they’re super tiny and even pocket-sized, so you’d have a lot less to carry around if you’re traveling with a MacBook. If you’re packing your Switch and MacBook for a trip, you can easily swap between the devices with ease without needing to pack a separate Mac gamepad. Just be sure consider what kinds of games you plan on playing on Mac before you decide to ditch the full-sized gamepad. And actually, if you bring your Switch, you’ll have not just one Mac gamepad on hand, but two—both Joy-Cons can be paired at the same time and used with applicable games. I fired up Super Mario Kart in OpenEmu and was able to throw down in two-player split-screen using both gamepads. They may not be robust controllers, but for simple two-player fun, they’ll do the trick. Given Nintendo’s use of Bluetooth for Switch controllers, it makes sense that the Switch Pro Controller also pairs swiftly with Mac using the exact same process. The Pro Controller looks and acts much like an Xbox One or Xbox 360 controller, with two analog sticks, a directional pad, and a full complement of face, shoulder, and trigger buttons. It’s also pricey at $70, yet currently near-impossible to find, since it’s such a benefit for playing Zelda on your TV. In any case, if you have a Switch Pro Controller, you might as well use it on Mac, right? As with the Joy-Cons, it worked perfectly with OpenEmu and its highly-customizable control schemes. It also played nicely with PixelJunk Monsters again, and once I created a gamepad profile within Steam, I was able to use it for the awesome Rocket League, as well as oddball gem Octodad: Dadliest Catch and indie blaster Luftrausers. Rocket League isn’t on Switch, but you can play it on Mac with your Pro Controller. Yet I ran into issues with other games that offer gamepad support, but wouldn’t recognize the Pro Controller. That was the case with everything from Nuclear Throne to Gone Home, Guacamelee, and Valve’s classic Portal, even with gamepad schemes engaged in the options. Your experience may vary, and perhaps it’s something that’ll improve over time as the Switch Pro Controller lands in more homes. The frustrations were, well, frustrating—but being able to wield a full gamepad for Rocket League and other Mac games made it worth the minimal hassle. If you snagged a Switch and also do a bit of gaming on Mac, you have little to lose by quickly pairing a Joy-Con and/or Pro Controller and seeing what works well. It could elevate your Mac gaming experience, or at the very least give you a more portable control option.